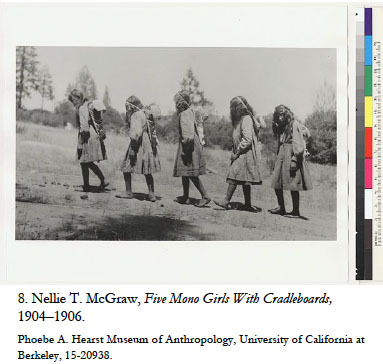 In my thesis I examine the photographs of the Hupa and Mono Indians and their reservations in California as taken by Presbyterian missionary Nellie Tichenor McGraw at the turn of the twentieth-century. My thesis is that unpublished photographs taken by missionary workers as part of their everyday experience working with American Indians are valuable alternative historical documents to the popular published, pseudo-documentary and artistic photographs taken by figures such as Edward S. Curtis, Emma B. Freeman, and A. W. Ericson. Missionary workers took photographs for their own personal consumption and without an eye for publication, hence they felt no pressure to project ideas of “art” onto their subjects. Photographers who hoped to market their images as postcards or fine art books catered to public ideas of the exotic other and played into romantic notions of American Indians as rapidly disappearing children of nature. The photographs by Nellie McGraw are a more straight forward depiction of American Indian life around 1900, not the posed, marketed version that received much more historical attention. The most famous photographer of American Indians is undoubtedly Edward S. Curtis. In his monumental twenty volume The North American Indian, Curtis sought to document “every phase of life among all tribes yet in primitive condition.” Although Curtis insisted his “artistic treatment” of the Indians did not “in any way [do] injustice to scientific accuracy or neglect the homelier phases of aboriginal life,” it is now widely known that he often posed his subjects in costumes that he himself had made—sometimes even going as far as photographing his white assistants in masks when tribal members refused to be documented—and often edited and retouched the final published photographs. McGraw’s work is indicative of that made by women teachers, government employees, and missionaries which remains largely absent from official or public photographic archives. Their work is often labeled as amateur for not following the conventions used by male photographers engaged in the “grand endeavors” of scientific and anthropological photography. Popular nineteenth-century photographers of American Indians combined documentary with aesthetic devices in order to make their images palatable to a Euro-American audience; often the resulting images were more romantic than ethnographic, yet they were touted as completely accurate and truthful. In his introduction to volume thirteen of The North American Indian, Curtis wrote that the impoverished living conditions of the tribes of Northern California were “still so acute that…[he found] it difficult even to mention the subject with calmness.” His photographs of these peoples, however, are the very picture of calmness. One is hard pressed to find any images of the “homelier phases” of Indian life in any of his twenty volumes. If one wants to see what daily Indian life was like at the turn of the century, he or she must turn to the work of individuals like Nellie McGraw. While not well-known, the photographs of female religious and government employees serve as important markers of cultural exchange and act as a counter-archive to the popular images produced by Curtis and others. Christopher M. Lyman, The Vanishing Race and Other Illusions (Washington, D.C.: Smithsonian Institution, 1982) 7. Edward S. Curtis, The North American Indian, 20 vols. and port. (privately printed, 1907-30), 5: xiii. Susan Bernardin et al, Trading Gazes: Euro-American Women Photographers and Native North Americans, 1880-1940 (New Brunswick, New Jersey: Rutgers University Press, 2003), 3. Curtis, North American Indian, 13: xii.